It is also not an unhiding issue. It is caused by Freeze Panes. It depends where you are when you set your Freeze Panes. Freeze Pane is in the View ribbon. Freeze Panes keeps certain rows at the top and columns to the left as you scroll around. But it can also stop you from seeing certain rows and columns. If you have scrolled to the right and then set your Freeze Panes then it can stop you seeing the columns on the left. 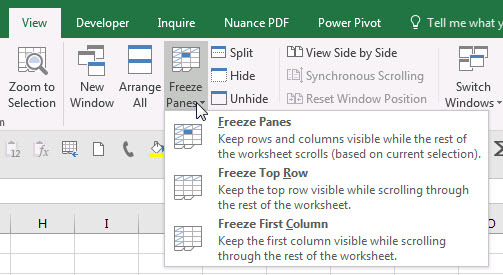 If you have scrolled down the sheet and then set your Freeze Panes it can stop you seeing the rows at the top. This is a toggle command so you can also use it to apply Freeze Panes.